Japan’s heartland in both geography and attitude, Central Honshū ( 本州中部 , ‘Honshū Chūbu’ in Japanese) stretches between the two great megalopolises in Kantō (home to Greater Tokyo) and Kansai (Osaka, Kyoto and Kōbe). This region is filled with modern commercial centres and traditional towns, the majestic Japan Alps ( 日本アルプス ) and the rugged northern coastline. In the region’s central prefectures, hiking takes you through alpine uplands and onsen (hot spring) villages that offer welcome recovery for skiers. The Sea of Japan region (Hokuriku) boasts clifftop vistas, remarkable temples and incredible seafood. Nagoya is the nation’s industrial heart, with a can-do spirit and unique foods, while Hokuriku’s hub is Kanazawa, a historic city that once housed samurai and geisha. Lovely Takayama is admired for its traditional riverside houses, wood crafts and verdant countryside. 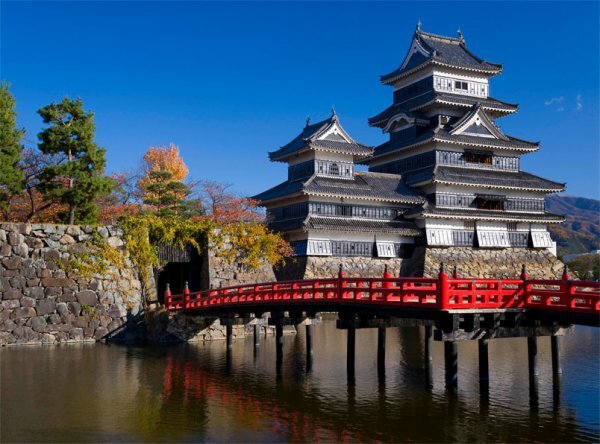 Matsumoto is popular for its striking 16th-century castle and many galleries. Central Honshū’s climate varies with its landscape. In the lowlands the best times to visit are April and May or late September to early November; temperatures are mild and clear sunny skies are the norm. Expect heavy rains in the tsuyu (monsoon) season (typically a few weeks beginning in mid-June), followed by sticky summers (through mid-September) capped with a typhoon season. In the Japan Alps, November to March are cold and snowy. Many roads are impassable then, and the highest peaks might remain snow-covered until June. July and August tend to be most agreeable for mountain hikers; snows are generally melted and temperatures warmest. Central Japan International Airport (NGO), near Nagoya, provides easy access from abroad, and there are limited international flights into Komatsu (near Kanazawa; Click here ) and Toyama ( Click here ). Nagoya is a hub for rail travel nationwide, and a shinkansen (bullet train) line links Tokyo with Nagano. Nagoya is Chūbu’s transport hub. The mountainous inland is best served by the JR Takayama and Chūō lines, which run north to south with hubs in Takayama (Takayama line) and Matsumoto and Nagano (Chūō line), respectively. The JR Hokuriku line follows the coast along the Sea of Japan, linking Fukui, Kanazawa and Toyama, and connecting to Kyoto and Osaka. Chūbu’s mountainous middle is served by bus, but plan carefully, as services can be inconvenient or stop entirely in bad weather. For some destinations, particularly Noto Peninsula, hiring a car makes sense. If Kyoto is a gracious geisha and Tokyo is a preening teen forever seeking the newest and coolest, then Nagoya ( 名古屋 ) is their stalwart brother. He may not be the flashiest in the family, but through smarts, perseverance and duty, he provides the fortune that enables the others to live the lives they choose. Japan’s fourth-largest city, Nagoya is an industrial powerhouse; if measured on its own, its region would rank among the top 20 economies worldwide. It started long ago, with a heritage called monozukuri – making things. It’s an article of faith that residents of this hard-working city can continue to earn a living even when everyone else is going broke. Toyota is only the most famous of the many manufacturers based here. It’s even the birthplace of pachinko (Japanese pinball). None of this marks Nagoya as a top-rank tourist destination, but since you’re likely to pass through (Nagoya’s a major transit hub), it’s worth a detour for its impressive castle, important shrine and temples, unique and accessible cuisine, attractive port, and urban amusement on a far more relaxed scale than Tokyo or Osaka. Locals and expats alike take pride in the hometown character of this friendly city. Nagoya also makes a useful base for day trips. From factory visits to ceramic villages to cormorant fishing, there’s plenty in the region to keep you – need we say it? – busy. On the western edge of the city centre, JR Nagoya Station (known locally as Meieki) is a city in itself, with department stores, boutiques, restaurants, hotels and observation decks on skyscrapers. Several train lines converge here, including shinkansen and the private regional lines Meitetsu and Kintetsu, and there are also subway and bus stations. Nagoya Station is quite large and confusing, so don’t plan on a quick transfer. From the east exit, Sakura-dōri runs towards the massive Eiffel Towerish TV tower, in the centre of the narrow Hisaya-ōdōri-kōen (Central Park). South and west of the TV tower are the Sakae and Nishiki districts, more atmospheric than Meieki and booming with shopping, dining and nightlife; the atmospheric Kakuōzan district is a few subway stops east of Sakae. The castle, Nagoya-jō, is just north of the city centre, while the Ōsu Kannon and, much further, Nagoya Port areas are to the south. English-language signage and a convenient subway system make navigating Nagoya relatively easy. Nagoya did not become a unified city until 1889, but it had a strong influence for centuries before. It is the ancestral home of Japan’s ‘three heroes’: Oda Nobunaga, the first unifier of Japan, followed by the shōgun Toyotomi Hideyoshi and Tokugawa Ieyasu, whose dictatorial reign from Edo also ushered in an era of peace, prosperity and the arts. Ieyasu ordered the construction of Nagoya-jō, which became an important outpost for 16 generations of the Tokugawa family in this region, known as the Owari clan. Nagoya grew into a centre of commerce, finance, industry, transport and shipping; during WWII some 10,000 Zero fighter planes were produced here. Manufacturing prominence led to massive Allied bombing – citizens were evacuated and roughly one quarter of the city was obliterated. The resulting blank slate allowed officials to plan the city you see today: wide avenues, subways, gleaming skyscrapers and green space. Today, Nagoya continues as a worldwide leader in automobiles, machinery, electronics and ceramics. One look at Nagoya’s many department stores shows the city’s thriving commercial sector, though it’s a mark of the severity of the current economic downturn in Japan that even Nagoyans are tightening their belts.